When doing CAD or other projects, there may be times when you will need to print on paper larger than 8.5 × 11 inches. 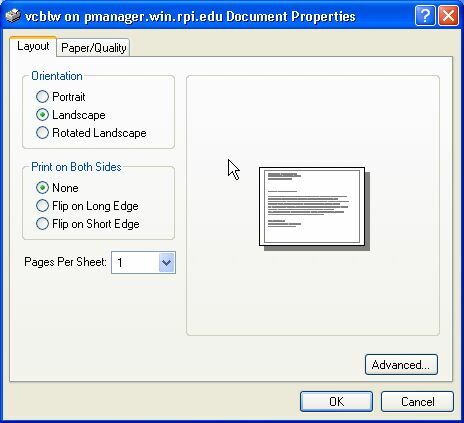 This document provides the basic procedures needed to set a custom paper size. First make sure that you set the page size correctly in SolidWorks or whatever program you are using. 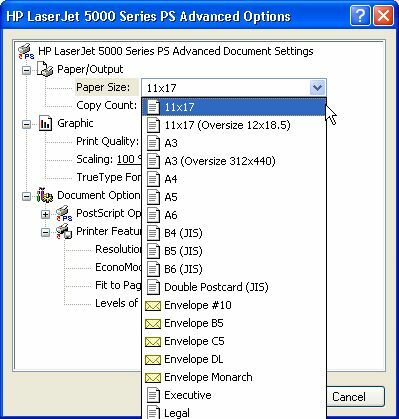 Then you must choose a printer that can load the paper size you want and select the appropriate settings in the printer driver properties. Note: The printers vcblw and vcsoutlw (black & white) and vc7750B (color) can print on B-size paper (11" x 17"), a size commonly required for CAD projects. The plotters (vcp7100, vcp7100g, and vcpltcf) use roll feed paper 36" wide up to 76" long. If you are in a public lab, the correct drivers for these printers are already installed. If you are using your own computer, you must first install the correct printer driver before proceeding with the instructions below. Please refer to the “Installing Printer Drivers” section of this website for information on how to install print drivers for various operating systems. Once you have finalized the document in your application, select Print from the File menu. 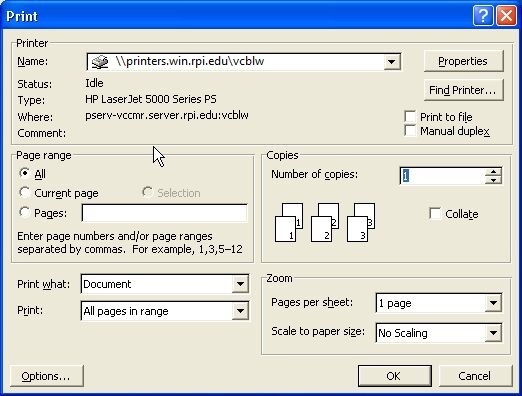 In the Name field, select vcblw from the drop-down list of printers, and then click the Properties button. In the document properties dialog box, select the Landscape option if appropriate. Then click the Advanced button. Now you need to select the paper size, in this case B-size. In the Paper Size field, click the down-arrow to display the drop-down menu and select 11x17 inches. Click OK.
Click the OK button until you return to the main print window. After you click OK in that window, your job will be placed in the print queue.